Loved this post. Reading about your association with your grandmother and New England in the fall reminds me of a trip my husband and I made to New England once to test-drive a new car (he worked for the car company). We visited a pioneer village (Sturbridge Village) and all the smells of the apple press, hot cider, fresh baked oatmeal cookies and the gorgeous fall colour were all brought back to me in this post. Not to mention there's something special about a pioneer village anyway with all those creaking wooden floors, worn furniture & homemade quilts. What a lovely post, filled with so many nostalgic memories of an era long gone. It evoked so many memories of my own grandparents. 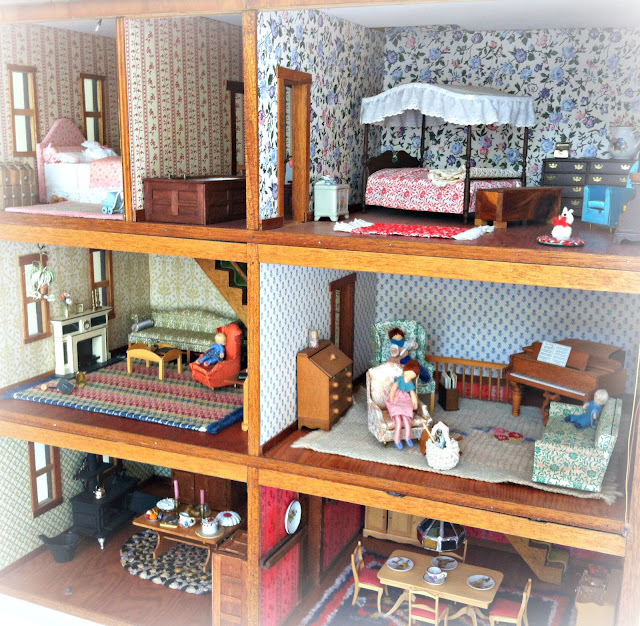 Love the dolls house, I hope mine lives on in the grandchildren's memories for many more years to come. I love September too, the thought of pumpkins, apples, spices, the coming of cooler weather, wood smoke. It is also our wedding anniversary, so it's extra special. Seriously, I am so ready for it to feel like autumn! As soon as it hit Sept 1st I was doing the happy dance "almost fall, almost fall". Of course, today, in my corner of SW GA, it is 90 degrees with heat index of 98! Arggg I want to put out my fall decor on my hutch, I want crisp evenings/cardigan weather with hot apple cider and pumpkin bread! I am a yankee girl transplanted in the south, am happy with no longer shoveling snow in the mornings all winter, etc, but heavens, I am ready for the temps to change!!! I want to see the fall leaves change color!!! Awww I loved reading about your fond memories of your grandparents house and all the special things that you have from them. I'm sure seeing those much loved things, brings them close to you in your beautiful heart, Deborah. Joe Froggers.... I remember making those years ago from a recipe I found in a magazine. I'd never heard of them till then. Yum! A lovely walk collection of memories. Your attic stories have me remembering crawling around in our own little attic in our farm house and smelling (seeing) the dust in the sunlight. How lovely to have such memories that you use them to help to relax when you can't sleep. This is a lovely post, Deborah! So heartfelt and you made your grandparents and their home real to me. I can almost picture their house from what you've written. And reading through the list of recipes you make that were your grandmother's reminds me of the old New England cookbooks I have. I can tell that September in Michigan must be more like October here in TN. It's still summer here for sure but the nights are cooler and there is just a different feel in the air. What a beautiful post, Deborah. I felt the warmth of that country kitchen as I read it. It made me think of all those I have loved and lost. Yes, I, too, love the month of September. We began our married life together in September....many, many Septembers ago. I love fall, its colors, its crunchy red apples, wooly sweaters and sipping Armagnac by a cozy fire. Can't wait for those crisp autumn days to begin. But....for now, we will still have to deal with 90 degree weather. Thank you for sharing your beautiful family memories with us. Dear Deborah, Such a beautiful post filled with thoughts of the love for your grandparents. They surely blessed you in many ways. What a treasure the dollhouse is and all the darling tiny pieces filling each room. I had to smile when you said you walked through their home in your thoughts remembering each and every corner. I do this too when I think of my childhood home in Dearborn and my grandma's home too. I can see each and every detail just how they left it. I too love this month and on into October. Even with our temps still very much like summer, you can feel a change coming and it will be very welcome after the soaring heat this year. I enjoyed this heartfelt and nostalgic post. We can always go back in our memories and that is so special. What a blessing!! Love your new pretty blog pic. Your hair cut is adorable! Have a nice long Labor Day weekend. I adore this post. You took me back to my own grandparents home and the days I spent there as a child. I also walk through their house in my mind, taking it all in once again. There really is something about this time of year that makes me feel very nostalgic, even more so than I already do every day. testing blogger no reply status . 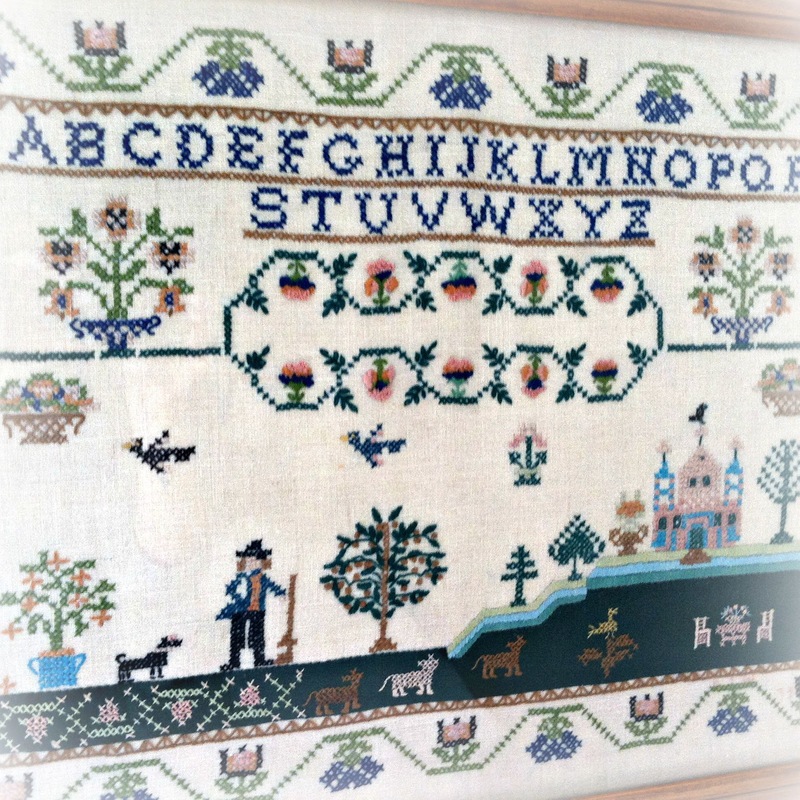 . .
A beautiful post, Deborah, full of loving memories of days gone by. How lovely to have these reminders of your grandparents in your own home. September is a month to remember, and also to plan. I feel the same way. I feel as though I was walking through those rooms along with you Deborah...your wonderful descriptions painted such a warm picture of these memories of yours. I like September too, not because it's my birth month (I try to ignore birthdays anymore) but like you, mostly because it ushers in the freshness that summer took away with it's heat and humidity and makes way a for fall. It sounds like you have inherited many treasures that I'm sure you will always cherish...LOVE the doll house! A truly beautiful post! I just loved this post...I think I was there in the attic and in the rooms with you. Beautiful. For a moment I thought you had begun to write a book; almost like a sweet novel and it IS! Yes, that's the way we can unravel our very being by looking back at those that instilled such fondness in us, at a tender age. What a blessing and both of your Grandparents must be smiling down from heaven when reading this! It is so true, the smells of certain things and fond memories stay with us till we die. Such a sweet way to hasten sleep! Deborah, this is a beautiful post, full of the things that matter most in life. My you always hold these memories close to your heart; may they always bring you comfort. p. s. did you cut your hair? It looks fabulous...even if you didn't cut it but it sure looks like it...??? Oh pretty friend, I so enjoyed this wonderful post, you write so beautifully, I feel I'm reading a story I love. I can relate to my great-greatparents house this way, here in Ecuador, although I also didn't see them much because our resident was in NYC. Their house was probably a turn of the century Spanish huge home, with two gardens and lovely furniture of the time. Great-grand always crocheted beautiful things, that's why I have heirlooms from my grandma and my mom, as they both learned from the great. Isn't wonderful to have memories of our past family, as this is what makes OUR very own history and they always bring a warm smile to our hearts. I completely understand why you think of them so much just reading this loving post. Any grandparent would be blessed to know their granddaughter so cherishes the work of their hands and loves them so much. I love the needlework and carefully crafted doll house Like you, this time of the year invigorates me and inspires me, and this post reminds me I have a doll house and some embroidery to work on...the joy of crisp mornings and evenings set apart by perfect sunny days have me excited for this season. I feel like I'm right there in your grandparent's house - it is too bad there are not more houses like that anymore. Just joy. I had an aunt who had a house like that - and my favorite thing was a lovely doll trunk with a doll and all her hand sewn clothes. Maybe that is where I got my love of dolls. Thanks for the fun post. Deborah, I agree. September is my favorite month in Michigan. And I'm a huge fan of grandparents and love the way you walk through your grandparents' home in your memory.